As Israel's war with Gaza continues, peace-loving people around the world become more agitated that a peaceful conclusion seems so far away, if attainable at all. Operation Protective Edge turned into a ground war over a week ago and that has meant more deaths on both sides. It is now the 25th day of the conflict and the death toll in the Israeli military has reached 56 with an additional three civilians. The most disturbing news out of Gaza is that an Israeli soldier, Hadar Goldin, has been kidnapped. Goldin is a member of the Givati Brigade. The Times of Israel reported earlier today that "The father of captured soldier 2nd-Lt. Hadar Goldin, Simha Goldin, says he's 'sure the army will not let up for a moment and will turn over every stone in Gaza to bring back Hadar safe and sound.'" At a press conference earlier today President Obama condemned the kidnapping of IDF soldier Hadar Goldin, saying, "We have unequivocally condemned Hamas and the Palestinian factions that were responsible for killing two soldiers, and abducting a third, almost minutes after a ceasefire was announced. That soldier needs to be unconditionally released, as soon as possible." "May the Lord our God protect captured Israeli soldier 2nd Lt. Hadar Goldin (Hadar ben Chedva Leah) and safeguard him from all harm. May God's canopy of peace spread out among all of God's children to bring an end to this conflict. May we soon see peace in the land and security throughout the region." 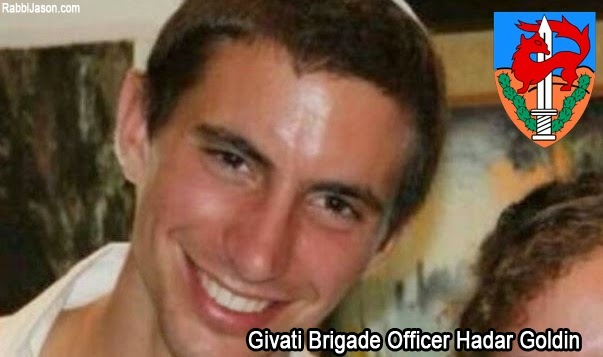 UPDATE: The IDF confirmed that Hadar Goldin was killed by Hamas on Saturday night Israel time.